Submitted by HS on Tue, 2011-07-26 11:12. Submitted by HS on Tue, 2011-07-26 11:14. The PunchLight SOLO is a small aluminium light unit which automatically indicates Recording start/stop and record "ready". The unit is powered directly via USB. No PSU or Midi Interface is needed ! 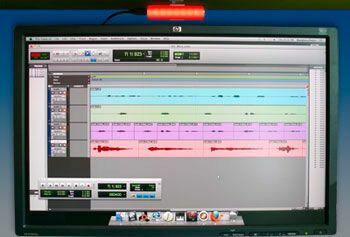 It is designed for anybody working in project, dubbing, or post production studios who needs visual confirmation of when a recording begins or ends. This simple, precise and easy to use device is perfect for musicians and sound engineers as well as film, TV and video editors. This version is no more available. Submitted by HS on Tue, 2011-07-26 11:15.